Not to be confused with Billy Joe Adcock. Joseph Wilbur "Billy Joe" Adcock (October 30, 1927 – May 3, 1999) was a major league baseball player and manager in the Major and Minor Leagues. He was best known as a first baseman and right-handed slugger with the powerful Milwaukee Braves teams of the 1950s, whose career included numerous home run feats. A sure-handed defensive player, he also retired with the third highest career fielding percentage by a first baseman (.994). His nickname "Billy Joe" was modeled after Vanderbilt University basketball star "Billy Joe Adcock" and was popularized by Vin Scully. Born in Coushatta, the seat of Red River Parish in northwestern Louisiana, Adcock attended Louisiana State University in Baton Rouge, where he played on the baseball team; before college, he had never played a game of baseball in his life. He was signed by the Cincinnati Reds, but Ted Kluszewski had firm hold of the team's first base slot. 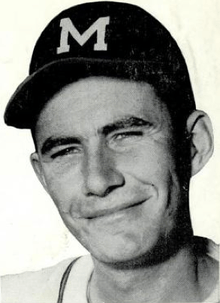 Adcock played in left field from 1950 to 1952, but was unhappy and demanded a trade, which he received. His first season with the Braves was capped by a mammoth home run into the center field bleachers at the Polo Grounds on April 29, 1953, a feat that had never been done before and would only be accomplished twice more, by Hank Aaron and Lou Brock. On July 31, 1954, Adcock accomplished the rare feat of homering four times in a single game, against the Brooklyn Dodgers at Ebbets Field. He also hit a double off the top of the wall to set a record for most total bases in a game (18) that stood for 48 years, until broken by Shawn Green in 2002. Adcock was often overshadowed both by his own teammates Aaron and Eddie Mathews, and by the other slugging first basemen in the league, Kluszewski and Gil Hodges, but he did make one All-Star team (1960) and was regularly among the league leaders in home runs. In 1956, he finished second in the National League in home runs, runs batted in, and slugging average. After concluding his playing career with the Cleveland Indians (1963) and Los Angeles/California Angels (1964–66), Adcock managed the Cleveland Indians for one year (1967), with the team registering its worst percentage finish in 21 years (.463, vs. .442 in 1946), finishing eighth in a 10-team league. Following the season he was replaced as Cleveland manager by Alvin Dark. Adcock managed two more years in the minor leagues before settling down at his 288-acre (1.2 km2) ranch in Coushatta to raise horses. He died in Coushatta at age 71 in 1999 from Alzheimer's Disease. ↑ Gregory H. Wolf. "Joe Adcock". SABR Baseball Biography Project. Society for American Baseball Research. Retrieved December 21, 2015. 1 2 Clines, Frank (May 4, 1999). "Braves slugger Adcock dies". Milwaukee Journal Sentinel. p. 1C. ↑ "Joe Adcock's 4 homers, double sets mark". Spokesman-Review. Associated Press. August 1, 1954. p. 1-sports. ↑ DiGiovanna, Mike (May 24, 2002). "Green stops slump with historic performance". Eugene Register-Guard. (Los Angeles Times). p. 3C. ↑ "Braves beat Haddix after 12 perfect innings". Victoria Advocate. Victoria, Texas. Associated Press. May 27, 1959. p. 8. ↑ Sayre, Alan (May 4, 1999). "Broke up baseball's longest no-hitter". Pittsburgh Post-Gazette. Associated Press. p. C-5. ↑ "Joe Adcock famous for 'homer' in 1959 game". Toledo Blade. Associated Press. May 4, 1999. p. 17.